Busy men are always looking for nutritious snacks to eat when they are on the go. Unfortunately, many of you end up grabbing high-carb, high-fat and low-protein convenience store snacks, which are terrible nutritional choices. Although the opinions of experts vary greatly as to how much protein men should consume on a daily basis, the generally accepted figure is one gram of protein per 2.2 pounds of body weight. Therefore, a 180-pound man should get about 82 grams of protein in his diet each day. If you're one of the many men who doesn't manage to meet this minimum requirement, or if you're simply looking for some alternative nutritious snack ideas, read on: The following nine high-protein snacks require little preparation and are generally low in both carbohydrates and fat. Believe it or not, this old classic is actually a healthy choice. On average, one ounce contains about 70 calories and one gram of fat, but delivers 11 grams of protein. However, the brands sold in convenience stores are often high in salt. If you'd like beef jerky to be one of your high-protein snack options, look for healthier versions in health food stores. One egg white has only 15 calories, is fat -- and-cholesterol-free and contains four grams of protein. Throw two or three in a pan (with some peppers and onions if you want to make an omelette) for a quick, nutritious mini-meal. 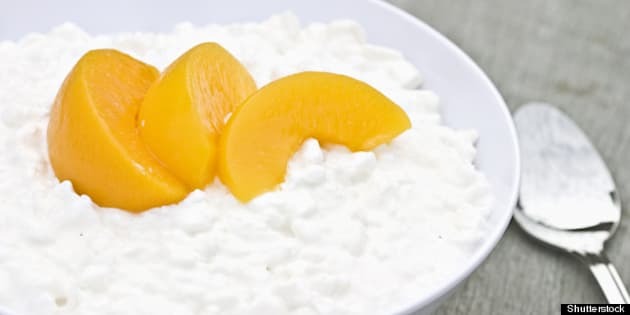 A half cup of 2 per cent cottage cheese contains on average 16 grams of protein, yet only has 102 calories and two grams of fat (as opposed to other types of cheese, which can be extremely high in fat). If high protein isn't your ideal goal, then mix it with some fresh fruit for a fast, healthy snack. Tuna is a great source of protein with approximately 25 grams per can. Plus, one can of tuna in water contains approximately 111 calories and is fat-free. And hey, go easy on the mayonnaise if you're making a sandwich -- it's full of fat. Although there are hundreds of varieties on the market, keep in mind that all protein bars are not created equal. Obviously, protein bars should be a high-protein snack, but be careful and avoid bars that are high in carbohydrates and fat. A good choice is DESIGNER WHEY Protein Bars: each 75-gram bar contains a full 30 grams of protein, with only six grams of carbs and five grams of fat. As with protein bars, many commercial protein shakes and powders can be high in carbohydrates. Advanced Protein, which delivers 20 grams of protein, two grams of fat and only two grams of carbs per scoop, is perfect for guys who work out. You can also make your own high-protein shake without protein powder. Although they may not seem appetizing on their own, putting a handful of them in your soup or salad will give your snack a protein boost. One cup of lentils has about 230 calories, one gram of fat and 18 grams of protein. If you loved peanut butter and jelly sandwiches as a kid, you're in luck: One tablespoon contains about four grams of protein, eight grams of fat and 95 calories. For an energy boost, spread it on a slice of whole-wheat bread (60 calories and one gram of fat) and top it with banana slices. According to Aubyn Garstang, a certified personal trainer, many men who train hard favor oatmeal for its balance of protein and good carbohydrates, which gives them the energy necessary to make it through an intense workout. One packet of instant oatmeal has about five grams of protein, 105 calories and two grams of fat. You can eat it alone or add some cinnamon to the mix. No matter how busy you are, it's really not that difficult to eat nutritious, high-protein snacks. If you keep a few cans of tuna and some eggs in your fridge at all times, you'll have some healthy alternatives to fatty junk foods like chips and chocolate bars. However, keep in mind that your body does need a certain amount of carbohydrates, which is the main source of energy for working muscles and other bodily functions. Therefore, you shouldn't try to eliminate carbs completely, especially if you work out. The key is to eat a balanced diet that includes lean protein, minimally refined carbs (whole grain pasta, whole grain rice), simple carbs (raw fruits and vegetables), and a small amount of fat in order to provide your body with all the nutrients and energy needed to function at your best capacity.